High Speed Internet Access and Wireless Access in all guest rooms, lobby, restaurant & lounge. 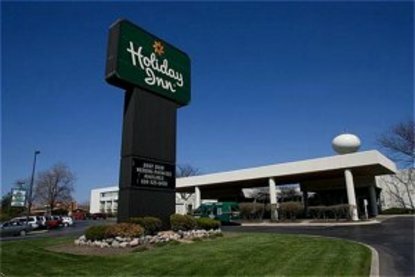 Conveniently located in the western suburbs of Chicago, Holiday Inn Hotel Chicago-Willowbrook/Hinsdale is accessible to all major expressways, Chicago's O'Hare International Airport and Chicago's Midway Airport (complimentary shuttle to and from Midway Airport). Neighboring the corporate communities of: Burr Ridge, Hinsdale, Oakbrook, Lemont and Woodridge, our full service hotel and conference facility provides top-level service and amenities to satisfy our business and leisure guests. All of the 220 guest room accommodations and suites have been newly renovated and have many conveniences and amenities. Willby's restaurant and lounge, outdoor pool, exercise room with a sauna and guest laundry facilites add to a very comfortable stay for our guests while attending a conference or visiting family in the greater Chicago area. This hotel is committed to providing accessible facilities under the American Disabilities Act. If your accessibility needs are not met, please contact the Hotel Manager on Duty. Should you require additional information regarding accessible facilities for guests with disabilities, please call 1-800-Holiday (U.S. and Canada) or contact the hotel directly. For the hearing impaired, TDD service is available at 1-800-238-5544 within the U.S. and Canada.